The respiratory system is a biological system that is responsible for gas exchange. It involves an interconnected group of organs and tissues that help you breathe. The main parts of this system are the airways, the lungs and linked blood vessels, and the muscles that enable breathing. God has created the respiratory system with an extremely efficient design. It includes the structures that are vital to completing its role in delivering life giving oxygen and removing poisonous carbon dioxide, all working in unison to complete their tasks. Air initially enters the respiratory system through the nasal and oral cavities. Both of these passageways meet at the same place- the pharynx. The pharynx then leads to the larynx, and down to the trachea. The trachea then branches in two different paths, known as the left and right primary bronchi. These small tubes carry the fresh oxygen deep into the lungs. The nose and mouth draw in the cold, dry air; this is where the cilia in the nose and mucus membrane come in. The cilia filter out fine particles from the air to keep them from entering and damaging the sensitive lung material. While the mucus membrane also traps fine particles, it warms and moistens the air coming in too. Generally the human body will draw its air from the nose, but in some cases it will take air in via the mouth. This is generally due to a blockage of the nasal passages, preventing the air to travel down without interference. It is potentially hazardous to breathe in with the mouth as the air does not receive as much filtration prior to reaching the lungs as it would if it was drawn in through the nose. As this air travels down the pharynx it gets filtered further. The same mucus which was produced by the goblet cells in the nasal passages has been swallowed and has coated the walls of the pharynx. The air then reaches the larynx. This is a small tube that is attached to the pharynx and is comprised mainly of tough cartilage. Its main function is to guide the air down towards the lungs but it also helps in speech. It is a primary factor in determining how one’s voice sounds. The tip of the larynx also is covered by a small sheath of tissue called the epiglottis. This covering keeps food and water from entering into the lungs by closing instantly as one swallows food or water. The larynx then leads to the trachea, a cartilage-ringed tube that branches off into two bronchi. Figure A shows the location of the respiratory structures in the body. Figure B is an enlarged image of airways, alveoli, and the capillaries. Figure C shows the location of gas exchange between the capillaries and alveoli. The bronchi branch out into the lungs, getting thinner and sparser as they go. Eventually they get thin enough as they are about to end, they can then be called bronchioles. These bronchioles are extremely thin, air-sac structures that harbor the precious oxygen before diffusion into the blood stream occurs. These small sacs are known as the alveoli. There are hundreds of small capillaries around the alveoli; they serve to transport the oxygen into the blood and the carbon dioxide out of the blood. The bronchi of the lungs branch off into several bronchioles. All these structures share in the function to trap and remove particles and foreign matter from the respiratory system as they too are coated with mucus and covered with cilia to help the body remove particles. As the bronchioles continue to divide hundreds of times over they meet their ending as a small air filled pocket. These pockets are the alveoli. They serve as the end point in the body for the fresh air and transfer the oxygen directly into the blood stream via the thousands of tiny capillaries that are wrapped around the alveoli. These capillaries quickly pick up the fresh oxygen and transfer it directly to the heart where it is then redistributed throughout the entire body. Not only does the alveolus play a vital role in the diffusion of oxygen, but it also serves to remove the body of carbon dioxide waste gas. This carbon dioxide is a byproduct of cellular functions and is constantly being produced in the body. Thus, the body must rid itself of this poison swiftly and efficiently. It does this via diffusion again. The carbon dioxide travels through the bloodstream and back to the capillaries intertwined with the alveoli. It then transfers into the alveoli and is removed from the body by exhalation. The diaphragm is a dome-shaped muscle located below your lungs. It separates the chest cavity from the abdominal cavity. The diaphragm is the main muscle used for breathing. The intercostal muscles are located between your ribs. They also play a major role in helping you breathe. Beneath your diaphragm are abdominal muscles. These help you breathe out when you're breathing fast (for example, during physical activity). Muscles in your neck and collarbone area help you breathe in when other muscles involved in breathing don't work properly, or when lung disease impairs your breathing. These structures are essential to breathing, but other structures are also crucial in this process. The ribs can not be left out. They are a group of twelve bones that offer protection for the lungs, and also a mounting point for important muscles. During gestation, the human fetus exchanges gasses, food, waste, etc. with the mother through the placenta. The lungs do not activate until the baby is born. The fetal circulatory system uses two "fetal shunts" to support respiration within the fetus. These are the foramen ovale and the ductus arteriosus. As the fetal construction process is underway, it eventually builds the heart. When the heart is functional, instructions to implement programmed cell death create a hole between the heart's atria. A flap-like valve is also constructed to keep blood flowing one-way through this hole (the foramen ovale). This allows the blood to pass through the heart, effectively bypassing the need for pulmonary interaction. In addition, the blood that normally flows to the lungs to exchange oxygen is shunted back into the circulatory system by the ductus arteriosus, bypassing the lungs altogether. This circulatory construct remains in place for the remainder of gestation. When the baby is born and takes a first breath, pressure on the foramen ovale is reversed and the valve closes permanently. The body then produces enzymes that cause the foramen ovale to seal over completely. Likewise the ductus arteriosus closes off. If the foramen ovale does not shut off, the individual may have issues with it for the rest of their lives. If the ductus arteriosus does not shut off, this could lead to heart failure and death. This very-high-risk "operational cutover" is a perfectly balanced and tuned construction designed to assist in the baby's nutrition and respiration during gestation all the way up to the first-breath. Then it switches over to the circulatory and respiratory systems as the individual will use them for the rest of their lives. After the first breath, this complex architecture is torn-down and forgotten, no differently than the scaffolding used to construct a building. Once the building is complete, we no longer have need of the scaffolding. The human respiratory system is highly prone to contracting and harboring diseases and illnesses largely because gas exchange provides an entry point for air born antigens. Not only is there a formidable amount of pathogens in the air one breathes, but there is also an alarming amount of pollution. One does not have to be a smoker to end up with a degenerative lung disorder, but may simply live in a busy city. The tailpipe emissions of all motor vehicles coupled with pollen, dust, mold, dander, and chemicals that are emitted into the air from manufacturing companies and similar facilities pose a difficult problem for a human’s health. All these things can be found in virtually every American city today and every American is exposed to one or more of these pollutants on a daily basis. It is no wonder why the most common cause of illness is linked directly to the respiratory system. All one has to do is breathe in the polluted air and it will take its toll on the body. One does not have to be a smoker to have lungs that are tinted black in color, no longer pink. He just has to be exposed to a running vehicle. One of the most common and easily treatable diseases of the respiratory system is Asthma. Asthma is caused by a restriction of respiratory airways. When an Asthma attack happens, the airways of the bronchioles constrict, causing extreme difficulty in breathing. Luckily, Asthma is not generally life threatening but it can be in some cases. It can be very quick to treat, but is considered impossible to cure. 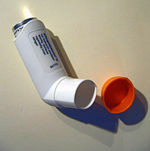 The use of handheld inhalers is an excellent tool in curbing the negative effects of Asthma. 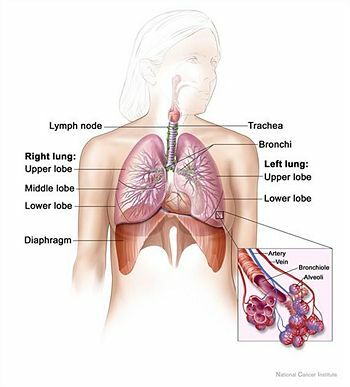 Lung cancer is another common disease of the respiratory system. In most Americans it is caused by the use of tobacco, or by the exposure to second hand tobacco smoke. In 90% of the cases the patient has at one time, or currently is a user of tobacco. The other 10%’s cancer is attributed to pollution and occupational exposures to carcinogenic materials. Lung cancer can be a devastating disease often causing death. Chronic obstructive pulmonary disease (COPD) is a respiratory system disease which impedes a person from getting enough oxygen to their lungs. 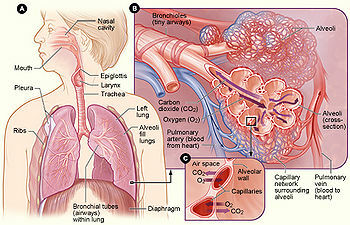 The lungs obtain the air a person breaths in by way of their windpipe and tubes in their lungs called bronchial tubes. These tubes, also called airways, are shaped like upside-down tree branches. At the ends of these branches are small air sacs called alveoli. The airways and sacs are made up of elastic material; this way they can change their volume to hold the appropriate amount of oxygen at any given time. The air sacs themselves act like small balloons. When you breathe in, each sac expands to contain the influx of air. Likewise, when you breathe out, the air sacs deflate as the air departs from them. Cystic fibrosis is an inherited disease of the secretory glands, including the glands that make mucus and sweat. Cystic fibrosis causes mucus builds up in the lungs and blocks airways. The buildup of mucus makes it easy for bacteria to grow. This leads to repeated, serious lung infections. Over time, these infections can severely damage the lungs. 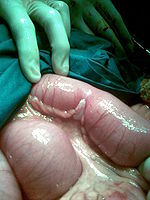 The thick, sticky mucus also can block tubes, or ducts, in the pancreas. As a result, the digestive enzymes that the pancreas makes can't reach the small intestine. These enzymes help break down the food that you eat. Without them, the intestines are unable to fully absorb fats and proteins. This can cause vitamin deficiency and malnutrition because nutrients leave the body unused. It also can cause bulky stools, intestinal gas, a swollen belly from severe constipation, and pain or discomfort. Cystic fibrosis also causes the sweat to become very salty. As a result, the body loses large amounts of salt when it sweats. This can upset the balance of minerals in the blood and cause a number of health problems. Examples include dehydration (a condition in which the body doesn't have enough fluids), increased heart rate, tiredness, weakness, decreased blood pressure, heat stroke, and (rarely) death. ↑ 1.0 1.1 1.2 Respiratory System by the National Heart Lung and Blood Institute. ↑ 5.0 5.1 5.2 What is Cystic Fibrosis by the National Heart Lung and Blood Institute. The Respiratory System M.J. Farabee, Maricopa, 2001. Structures of the Human Respiratory System Daniel Rice, Stemnet, October 22, 1998. Human Respiratory System Disease Murray Grossan MD, Medical Supplies & Equipment Company, LLC, Feb. 05, 2009. Human Physiology- Respiration Ritch Iso, Harvey Project, July 23, 2008. Respiratory System Maria Luisa Padilla, B.S., M.D., MSN, 2008. The effects of environmental pollution on the respiratory system Sichletidis L, JIACI, 2005. Introductory Anatomy: Respiratory System Dr D.R.Johnson, University of Leeds, January 03, 2006. Respiratory System for Kids Annette Lamb and Larry Johnson, 42 Explore, December 2001. Respiratory System: Lectures AC Brown, acbrown.com, Jan. 31, 2004. Respiratory System Gas Exchange Bruce Forciea, TeeJay Spilman, Feb. 05, 2009. This page was last modified on 12 July 2016, at 16:11.